by John Evangelist Walsh, © 1982, 2011. 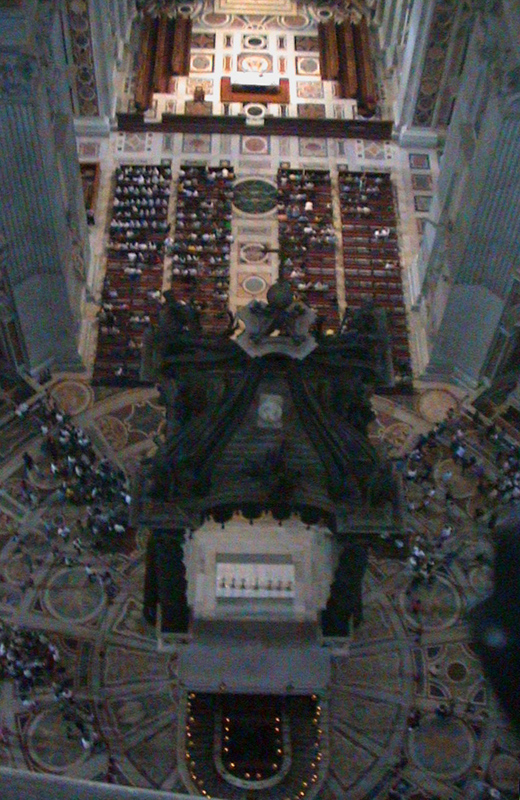 An ancient legend stated that St. Peter’s Basilica had been built on top of St. Peter’s grave and that his bones could be found under its High or Main Altar. However, outside of this legend there was almost no evidence to support this startling claim. That is, until the relatively recent excavations which were completed in 1968 AD. Writer John Evangelist Walsh sparks your interest in the opening chapter and grips your attention all the way through his best-selling book on The Bones of St. Peter. It reads like a mystery novel. In mystery novels you know someone was murdered, but the question is how and by whom. Here we know the conclusion. 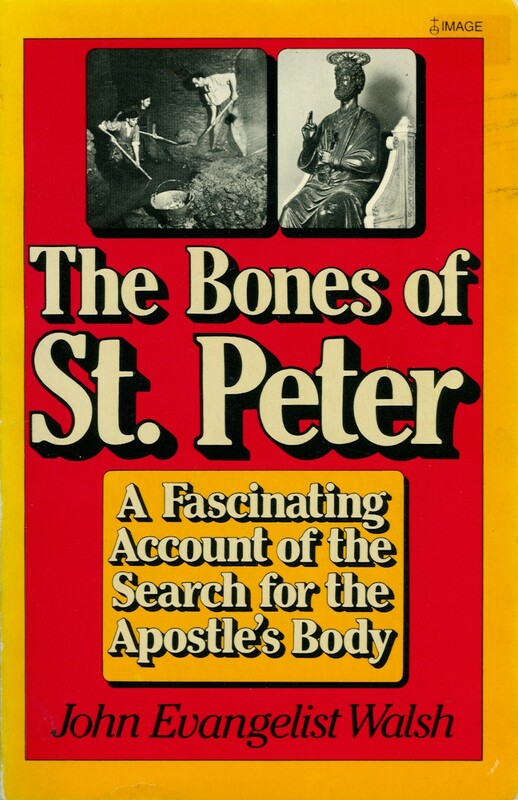 St. Peter’s bones were discovered and positively identified. However, many questions seem impossible to answer with certitude. 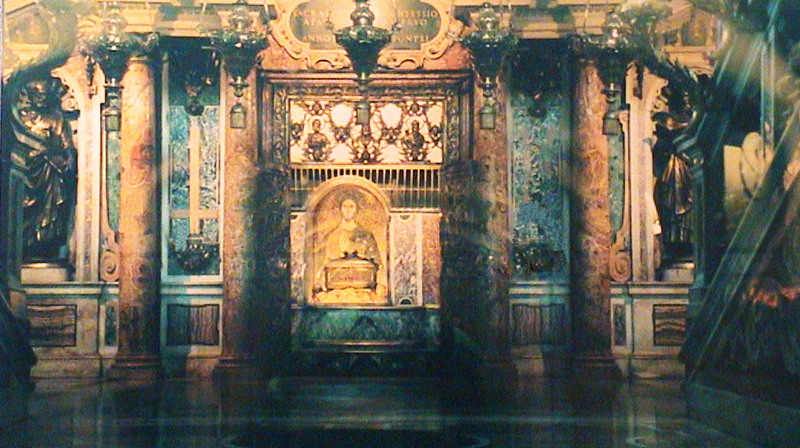 How could we know with certainty that we truly had uncovered St. Peter’s grave and found his bones. How could it ever be possible to prove this legend? If I had not read this book, I have to confess, I would have been most skeptical that such a legend could ever have been proved. Mr. Walsh presents the facts and makes a solid case. Bones were discovered in the excavation underneath the High Altar in Saint Peter’s Basilica in Vatican City. 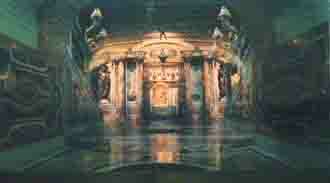 The bones had been undisturbed from the middle of the third century until the excavations that began in 1939 AD. But, how could their identity be proven? What facts were revealed in the excavations that enabled the Pope in 1968 to declare with certainty that St. Peter, the Apostle’s bones had been discovered? Mr. Walsh lays out the facts, the discoveries, and the brilliant analysis in a most interesting way. You will have to read this book to get the answers to all these questions, but in this pamphlet I want give you a hint of the fascinating discoveries that you will find there. 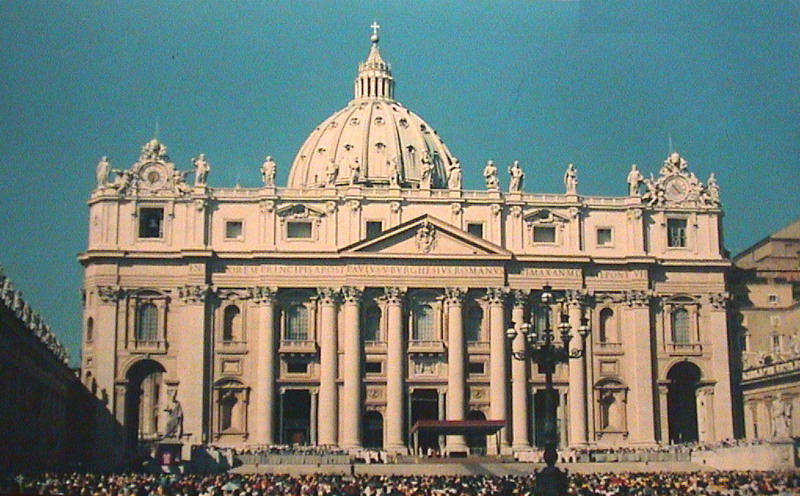 An early reference to St. Peter's gave was to the “trophy” built above it. 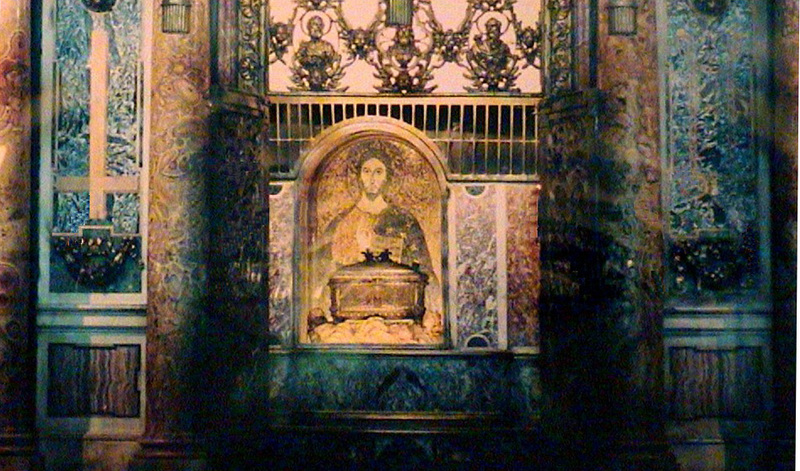 The “trophy” or Greek Tropaion, was a monument built over the grave of St. Peter’s body. It was referred to by the priest Gaius in about AD 200 . Read more about it in the book the Bones of St. Peter by John E Walsh. For example, notice what is called the Niche of the Pillia above. 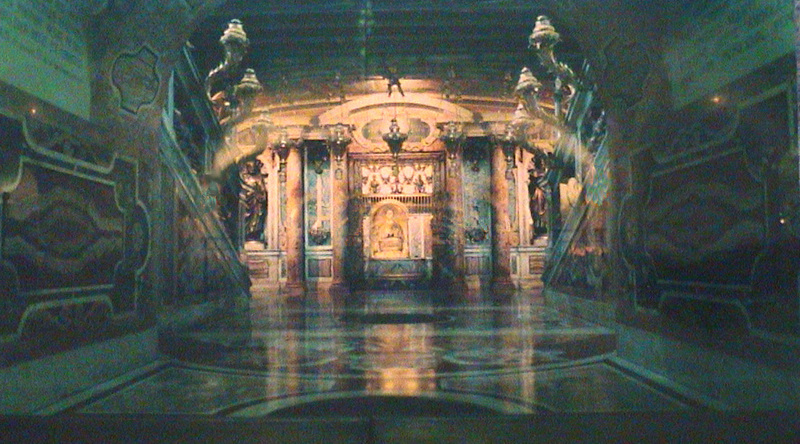 It is located in what is now the basement area of St. Peter’s Basilica underneath the main or High Altar. Look closely at the Icon of Jesus Christ and the grill above it. Why is it so lopsided? Or is it lopsided? And why is the cross to the left upside down? You will have to read the book to get the answer to this and so many other questions. 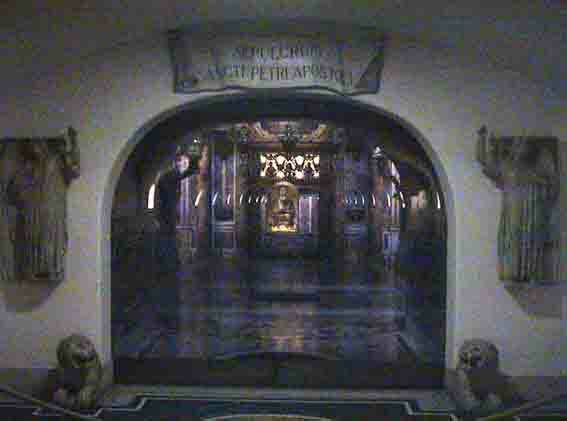 Protestants will often claim that the bones found under St. Peter’s were not his, but that of a woman. So, what is the whole story ? The Holy Father realized that the validity of the Catholic faith would not rise or fall with this legend proven either way. So, prudently he instructed all concerned not to make any assertions until the excavations had been completed and all the data had been thoroughly analyzed in a professional way. Contrary to his wishes an enterprising Italian journalist presumptuously reported that some bones found near St. Peter’s grave were indeed his. And the New York Times on August 22, 1949 ran a headline on page one stating that Peter’s bones had been found. 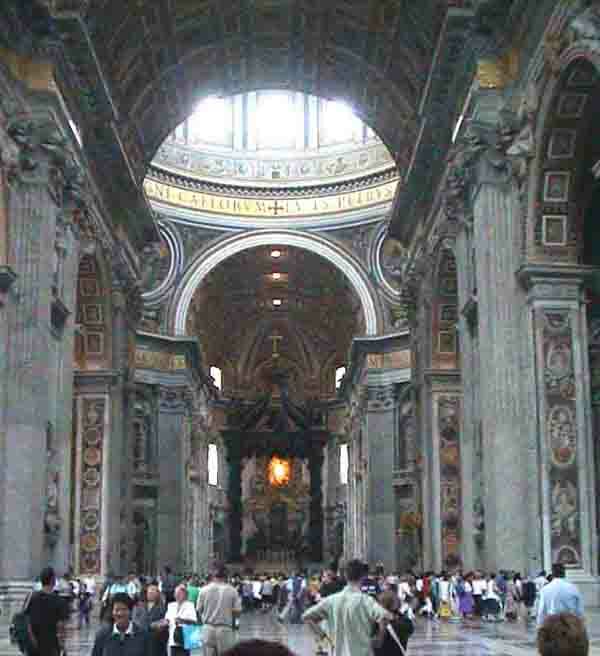 However, these were not St. Peter’s. What had been found were bones belonging to a woman and two men, neither of whom were St. Peter. So, some Protestants focus exclusively on this blunder. 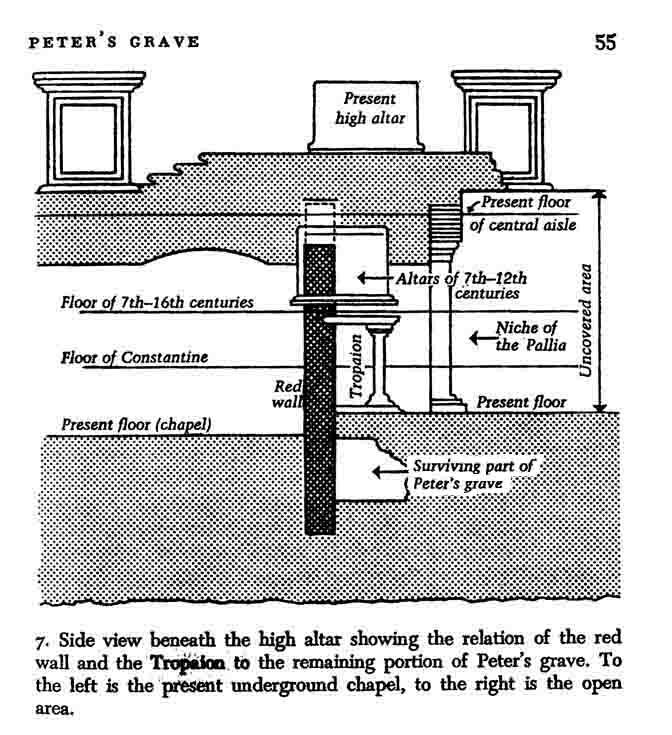 Actually St. Peter’s grave turned out to be empty of bones except for that of a mouse. And most interestingly that mouse had a role in confirming the other data which provides an overabundant proof of the identity of St. Peter’s bones. Not wanting to spoil the story, I will save the details for what will be a joyful experience in your reading the book. 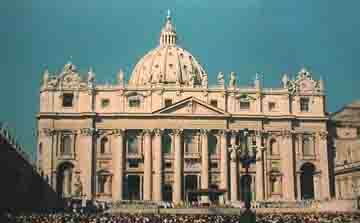 One of the important details in the proof of the identity of the bones is the location of Saint Peter’s Basilica. It was built on the side of a large hill. From an architectural point of view this is the worst possible place to build such a large building. The section below from the book gives you a hint as why this location had to be as it is. the one thing is clear: the transfer must have taken place before the Emperor’s dramatic arrival on the scene. But who, in that case, did order the removal? And when was it done and for what possible reason? Instinct whispers that the answers to those tantalizing questions may well provide the key to much that is still, more than a dozen years after Pope Paul’s announcement, at odds in the history of the relics. “Simon Peter, the son of John, from the village of Bethsaida in the province of Galilee, brother of Andrew the apostle, and himself chief of the apostles, after having been bishop of the church of Antioch and having preached to the Dispersion . . . pushed on to Rome in the second year of Claudius to over-throw Simon Magus, and held the sacerdotal chair there for twenty-five years until the last, that is the fourteenth, year of Nero. At his hands he received the crown of martyrdom being nailed to the cross with his head towards the ground and his feet raised on high, asserting that he was unworthy to be crucified in the same manner as his Lord” (Lives of Illustrious Men 1 A.D. 396). 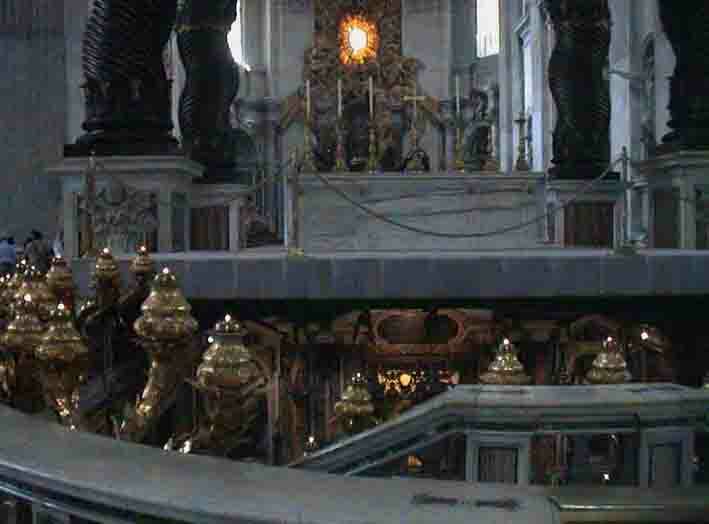 When St. Peter’s bones where found this fact was further attested to by the fact that although they found bones from every other part of his body, even some of his finger bones, none of the bones where found from his feet. This suggests that his feet were separated from his body. And this would have been the easiest way to take down a body that was attached to a cross upside down, that is by chopping off the feet. Because the author relates the information as it was chronologically revealed, you will find yourself anxiously awaiting the newly discovered facts that come with the turning of each page. You can read the full contents of this book, complete with pictures and illustrations. 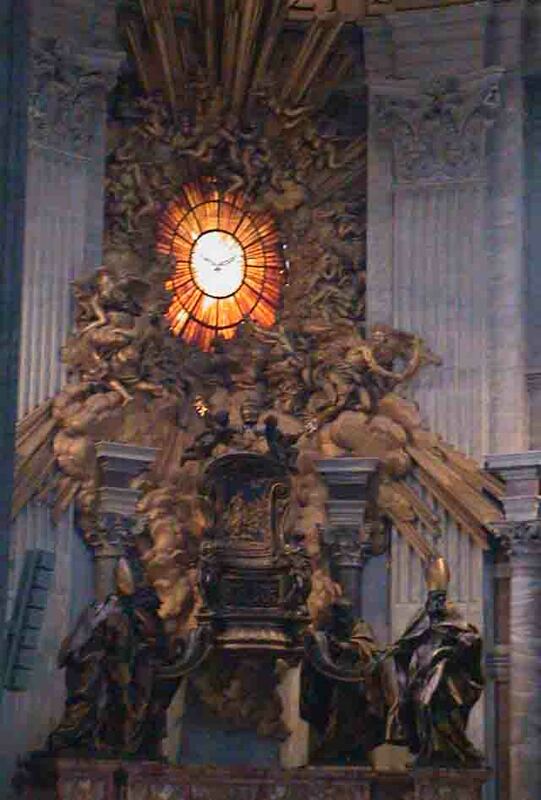 Does the church possess the actual bones of St. Peter? Fr. Saunders responds. The High Altar under the canopy. Statue of Saint Helena who discovered the True Cross can be seen to the left. Looking down on Bernini’s bronze Canopy (Baldacchino) covering the Papal (High) Altar with chalices on top inside St. Peter’s Basilica. The Canopy was designed by Gian Lorenzo Bernini (1633). 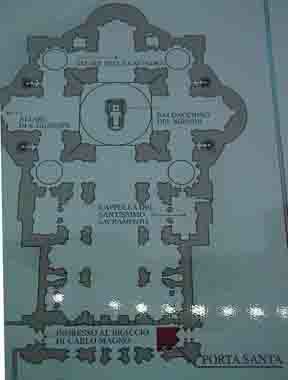 The Aspe is in the upper section of the picture and the staircase going down to the crypt and the Niche of the Pillia is in the lower part of the picture. Holy Spirit window in background above the High Altar. 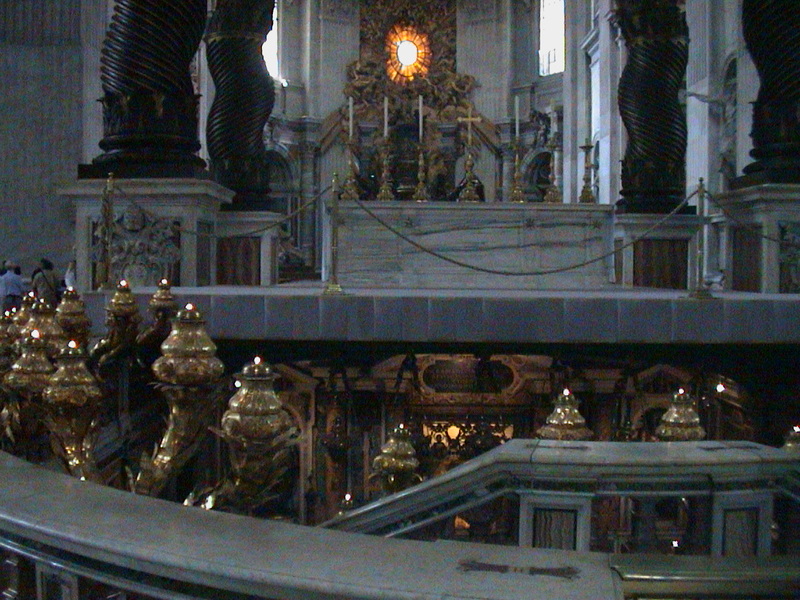 The staircase in front of Altar goes down to Niche of the Pillia. 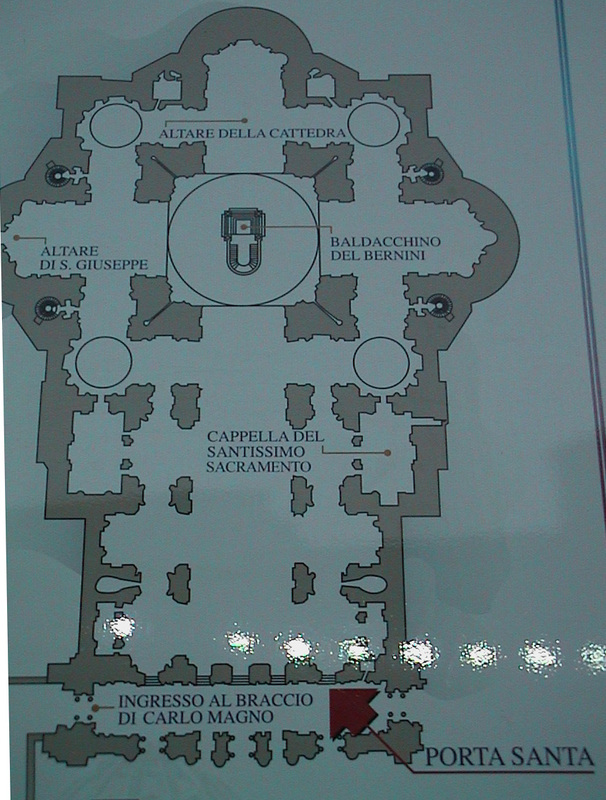 In the far end of the Aspe is the Holy Spirit window. 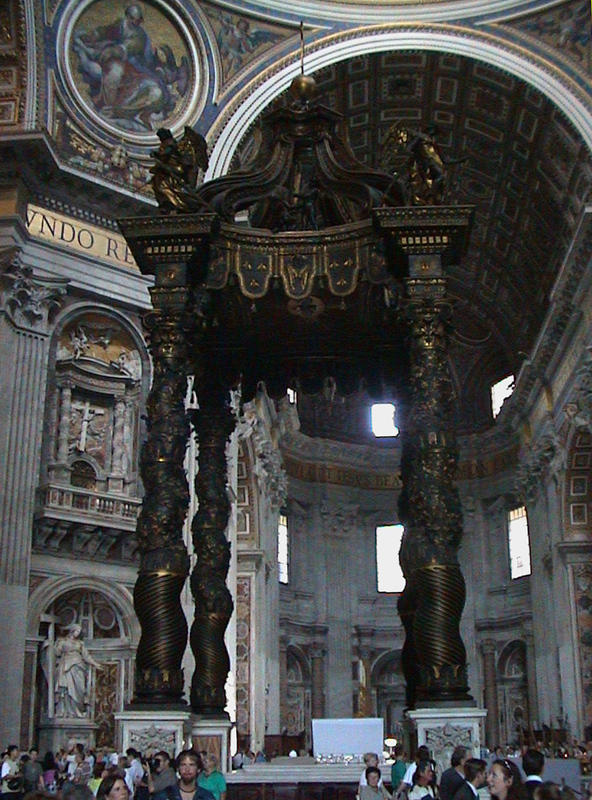 Below it is the Chair of St. Peter. 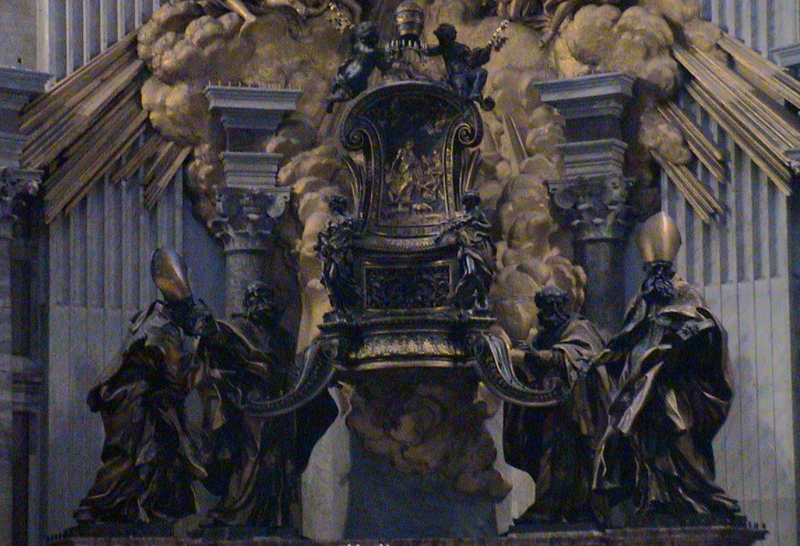 The Chair of St. Peter is figuratively supported by two Western Fathers and two Eastern Fathers, each a Doctor of the Church (Ambrose, Augustine, Athanasius, Chrysostom.) See More Articles defending the Papacy.